VueMinder can instantly sync calendar data between multiple computers. Setup is very easy. These instructions will guide you through it. The first step is to install VueMinder Pro or Ultimate on each computer where you'd like to share data. Fully-functional trial versions can be downloaded here. The Lite version cannot share data. The Pro version can share events only. The Ultimate version can share events, tasks, notes, contacts, and custom data fields. If you've already purchased a license, please be aware that sharing calendar data doesn't mean that only one user license is needed. Each user must have a valid purchased license, regardless of whether data is shared. For example, if 8 people will be using VueMinder and sharing data, then 8 licenses would need to be purchased. The only exception to this rule is when VueMinder is used at home. A single user licenses covers all family members living in the same residence. Discounts are provided when purchasing multiple user license. Also, if there are more than approximately 10 users, purchasing a site license would be more affordable than purchasing individual user licenses. You can find more information about the volume discounts and site licenses here. VueMinder syncs data through MySQL Server, the world's most popular open source database. If you already have MySQL Server installed on one of your computers or website server, you can use the existing installation and skip to Step 3. VueMinder will add a new database to the server. It won't affect any other databases on the server. However, you might need to create additional user accounts or modify permissions. See #15 below for more details. MySQL Server Community Edition is free. You can install MySQL Server on any computer on your network, including a computer that will also be running VueMinder. The instructions below assume installation of MySQL Server on a Windows computer. Instructions for other operating systems would be similar. MySQL Server only needs to be installed on one computer, and doesn't require a dedicated server. Any computer on your network will do, provided your other computers are able to connect to the computer where MySQL Server is installed. You can also run VueMinder on the same computer where MySQL Server is installed. Save the installer to your computer and then open or run the downloaded file. The MySQL Installer will launch. If a User Account Control window appears asking if you'd like to allow the installer to make changes to your computer, click Yes. Wait a few seconds for the installer to initialize. Review the license agreement and then click the "I accept the license terms" box. Click Next. Choose the "Custom" setup type and click Next. Select the "MySQL Server", "MySQL Workbench", and "MySQL Notifier" components for installation. Use the right arrow button to move the selected components into the "Products/Features To Be Installed" box on the right side of the window. Note: there are two versions of MySQL Server and MySQL Workbench to choose from, either X64 or X86. If your operating system is 64-bit (this is usually the case), then choose the X64 versions. Also, uncheck "Developer Components" and "Server data files". Click the Next button after adding MySQL Server, MySQL Workbench, and MySQL Notifier to the list of products to be installed. MySQL Installer will check requirements. If all requirements are met, click the Next button. Click the "Execute" button to begin the installation. The products will begin installing. This might take a few minutes. When installation is completed, click the Next button. MySQL Server will need to be configured. Click the Next button to go to the Configuration step. Choose the "Standalone MySQL Server / Classic MySQL Replication" option and click the Next button. If you don't see a Next button, open your display settings, change your text scaling to 100%, log out of Windows, and log back in. Choose the Server Configuration Type, depending on how your computer is used. If you'll be running VueMinder and other applications on the computer, we recommend picking "Development Machine" (even if you aren't doing any development) since this will use minimal system resources. Better server performance can be achieved by selecting the "Server Machine" or "Dedicated Machine" options. Make sure the "TCP/IP" box is checked. The default port is 3306. You can change this value if you have a good reason, but you'll need to make a note of what port has been selected. We recommend keeping the default port 3306. Also make sure the "Open Firewall port for network access" box is checked. If you don't open the firewall port, data sharing won't work! Click the Next button. Enter a root password. Make sure to record this password in a secure place. Click the "Add User" button to create user accounts. These account names will be used by VueMinder for sharing data and configuring permissions. We recommend creating a user account for each person that will be sharing data. You can assign the person a password or have them come to your computer and type in their desired password. Accounts can also be created and managed later by using MySQL Workbench. Make sure the Host is set to "<All Hosts (%)>" when adding user accounts. Note, the default DB Admin role should be used only if security isn't a concern. For more restrictive permissions, use MySQL Workbench (after MySQL Installer is finished) to create the user accounts instead of doing this in MySQL Installer, which doesn't provide a single pre-defined role with the permissions necessary for VueMinder. User accounts can be created under the "Users and Privileges" area of the SQL Workbench. User accounts need (at a minimum) the following privileges: ALTER, CREATE, DELETE, INSERT, SELECT, and UPDATE. These can be assigned by using the checkboxes. See the MySQL Workbench documentation for more information. Click the Next button after defining the user accounts in MySQL Installer. Enter a service name. You can accept the default or type in a more descriptive value such as "MySQLVueMinder". Make sure the "Configure MySQL Server as a Windows Service" and "Start the MySQL Server at Windows Startup" boxes are checked. Leave the "Enable X Protocol / MySQL as a Document Store" box unchecked and click the Next button. Click the Next button. The "Apply Server Configuration" step will appear. Click the "Execute" button to complete the installation of MySQL Server. Click the Finish button. If you need to add user accounts with more restrictive permissions (as described above), you can access MySQL Workbench from the Start menu. After installing MySQL Server, the next step is to enable data sharing in VueMinder. By default, all data is local and won't be shared. You can selectively pick and choose which calendars you want to share. You can also choose whether contact data should be shared (if using VueMinder Ultimate). These options are described in more detail below. For "Host", enter the computer name or IP address where MySQL Server was installed. If you're not sure what computer name to enter, run MySQL Workbench on the computer where MySQL Server was installed. Go to the "Server Status" and make a note of the "Host" value. This is the value that needs to be entered in the Sharing Options of each VueMinder installation. Also note the port number and make sure the same value is entered in VueMinder. The default port number is 3306. 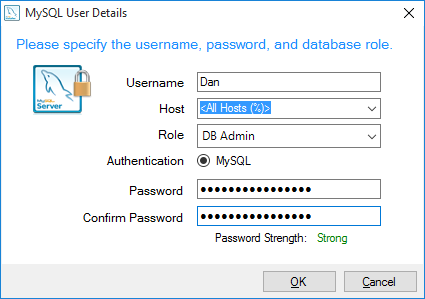 After entering the host name, enter a MySQL Server username and password configured previously. We recommend that each person sharing data have their own username and password. Additional options are provided for sharing data. Check or uncheck these depending on your needs. Share calendar and event appearances - Calendar colors will sync when this option is enabled on all computers. To color-code items based on the associated calendar, make sure the "Color Events Using -> Calendar Colors" option on the View menu is checked on each computer. Share category, location, and priority appearances - The category, location, and priority lists and colors will sync when this option is enabled on all computers. To color-code based on one of these data types, select the desired color mode on the View menu under "Color Events Using". Share event completion status - The completion status of events (and tasks) will sync when this option is enabled. When an event or task is marked as being complete on one computer, it will also be marked as complete on all other computers. Note, there are reminder options to suppress reminders for completed items and to automatically mark items as being complete when the associate reminder is dismissed. Depending on how these options are configured, if you share completion status and dismiss a reminder, you could cause the reminder to not appear for other users. Share contact data - Contacts will sync between computers when this option is enabled in the Ultimate version. If you have some contacts you don't want to sync, check the "Private contact" box in the Contact Editor. Click the "Test Connection" button to verify VueMinder will be able to connect and share data. If all goes well, you should see a success message. If the connection fails, an error message will provide additional information about the problem. If the message says that VueMinder couldn't connect to the specified MySQL host, a firewall on the server is likely blocking communication. Scroll down to the troubleshooting information on this page for information on how to fix the problem. Otherwise, click the OK button and repeat on each computer where you want to share calendars. By default, calendars won't be shared. To enable sharing of a calendar, double-click the calendar's name in the calendar list to open the Calendar Properties window. Click the "Sync" tab and check the box labeled "Share with VueMinder on other computers". By default, only your database account will have read/write access to the shared calendar. Other people connecting to your server will be able to view the calendar but not make modifications. Also, the shared calendar will automatically appear on all other computers that have been configured for sharing. If you want to restrict the calendar to only appear for certain users, change "(Everyone)" to "No Access". Enter the other user names and select the desired permission level. You can also use the "(Everyone)" entry to also give all users contributor access, if desired. In the example below, Dan is sharing his calendar. Only he and Michelle will be able to modify the calendar. Megan and Chuck can read the calendar but can't make any changes. Other users connecting to the server won't see Dan's calendar, but they can configure their own calendars to be shared with whatever permissions they want. IMPORTANT: The user IDs are the user account names that have been configured in MySQL Server - not the Windows login accounts. After entering the desired user permissions, click the OK button. The calendar will automatically sync with the server and appear on other computers (that have reader or contributor access). If your calendar already contains many events, it might take a few seconds for the initial sync to complete. Subsequent syncs will be almost instantaneous. On the computer running MySQL Server, open the firewall settings in the Control Panel, under System and Security -> Windows Firewall. Click the Advanced Settings button on the left. Click Inbound Rules and then scroll down to the MySQL Service name. The name will vary depending on what you named the service when in MySQL Installer. Right-click and select "Properties" from the popup menu. Click the Advanced tab and check the boxes labeled Domain, Private, and Public. Click the Protocols and Ports tab. Make sure the protocol type is set to TCP on the port that was selected when MySQL Server was installed (the default is 3306). Click the OK button and then try testing the connection in VueMinder again. Additional troubleshooting information can be found here.